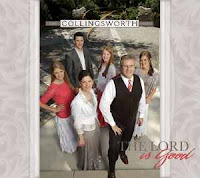 Since their last CD release in 2011, fans of the Collingsworth Family have eagerly awaited a new project. At least this fan has. I wasn’t disappointed at all with The Lord is Good, the latest CD to be added to the excellent repertoire of this award-winning family of music. With five upbeat songs, and seven slower tunes, there’s sure to be something for everyone. Stylistically, the music is more laid-back than some older songs that the family has sung. The Collingsworth’s give a new treatment to the old song "Show a Little Bit of Love and Kindness." It’s an upbeat tune led by Olivia, the family’s youngest member. Olivia is proving to be quite the capable soloist, and I believe as she grows out of her teen years, she will improve even more, the same way her siblings have already done. Phillip too, is singing better than ever, as showcased in the song "How Great His Love For Me," which may be the greatest power ballad--even, arguably, the greatest slow song--that the Collingsworth Family has ever done. "If He Hung the Moon" is a beautifully-crafted slow song that’s sung by Kim and the two older girls, Brooklyn and Courtney. It’s a flashback to the time when the family found it necessary to create little subgroups (e.g. just the girls, the older kids, etc.) for the reason that not all the kids had yet matured vocally. Although it’s no longer necessary for the family to create these smaller "subgroups," it’s still a nice treat occasionally. Campmeeting memories come flooding back when I listen to "I Could Never Outlove the Lord," a Gloria Gaither classic. Phil and Kim sing the verses together, and the whole family joins together on the chorus. It brings the family together nicely I think. I enjoy the organ too, I think it adds a nice "campmeeting" feel to the song. Song selection was excellent for The Lord is Good, lyrically, musically, as well as tempo-wise. The ratio of fast songs to slow songs is much better than last album--on the Collingsworth’s 2011 release, Part of the Family--which had only three upbeat songs in comparison with nine slower numbers. As I mentioned earlier, The Lord is Good has five fast songs in comparison with seven slow songs. This is a huge improvement, and should boost the album rating with a lot of people. The Lord is Good is a definite must-buy. The Collingsworth Family has become one of the more popular groups in Southern Gospel music in recent years, and fans will find plenty to like on their latest effort. Although not every track is a five-star song, there are certainly enough for me to recommend it whole-heartedly.